My wife, Betsy Alexander, recently returned from ten days in Canada. And all I got was this wonderful, amazing, right-up-my-alley t-shirt by indigenous artist, Andy Everson. Says Andy, “Skulls bring up a wide gamut of emotions. Each and every one represents a life lived and a life lost. We honour that our ancestors are now in the ground. 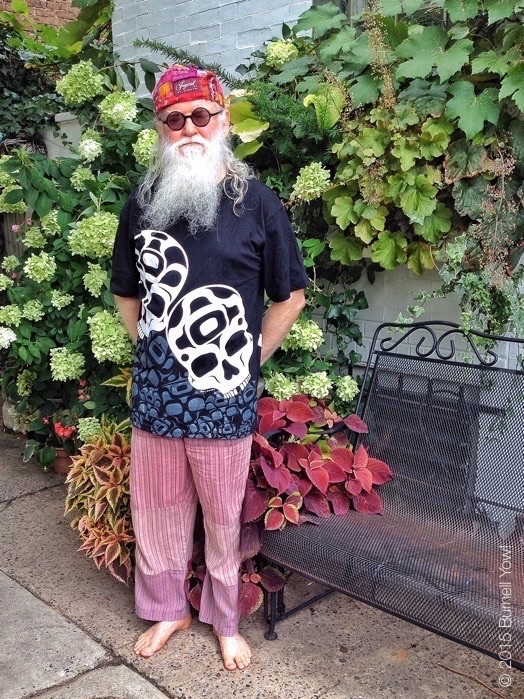 They surround us…the story is in the soil.” The trousers are “Puttin’ On The Jam” pants from Soul-Flower.com, and the one of a kind hat made from sewn-together clothing labels is by trash artist, Donna Steck-McMahon. Body by the planet Earth, but it’s only on loan.